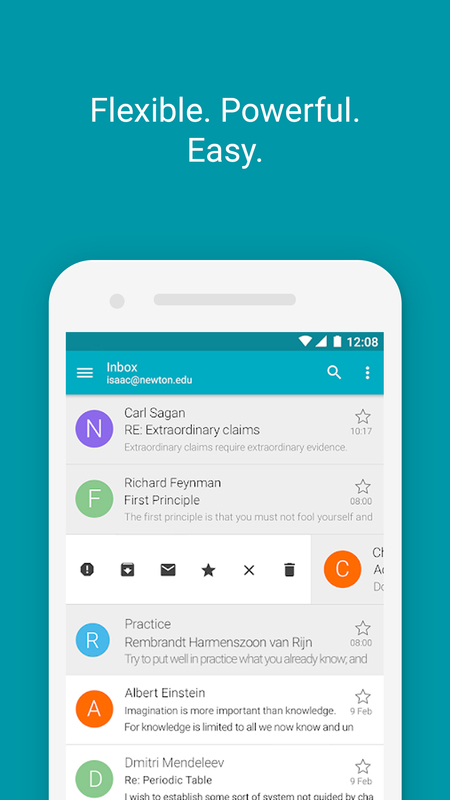 Easy onboarding with the most advanced Android email app. Use for your personal accounts or corporate push mail for most mail services and self-hosted IMAP servers, including Exchange and Office 365. Rich text editor for embedding images, formatting and styling. Automatic setup for popular email services like Gmail, Yahoo, Hotmail, FastMail, Apple, GMX, AOL and more. 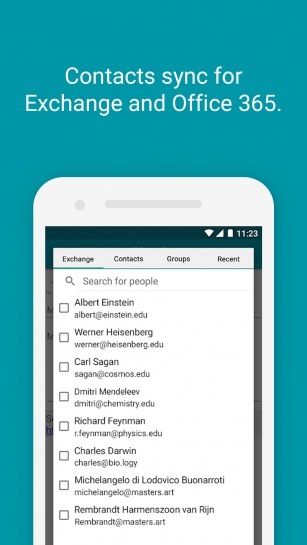 Supported email accounts hosted by: Google Apps, Yahoo BizMail, Office 365, Exchange Online and others. Backup and restore your data on local data storage or on cloud services such as Dropbox, OneDrive, Box and Google Drive. 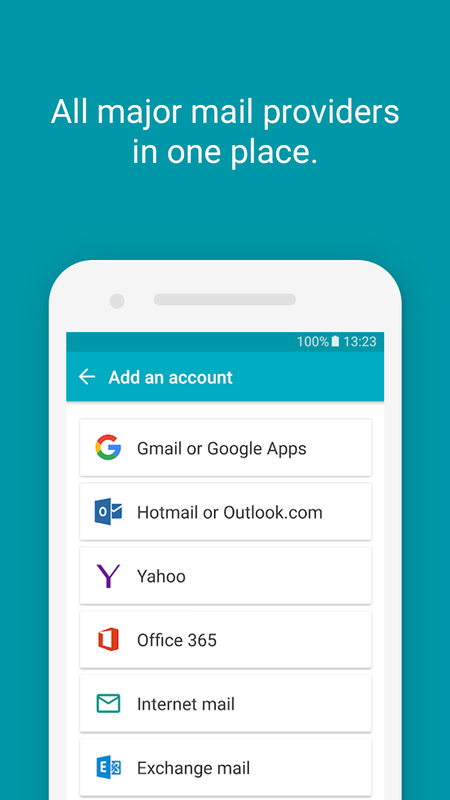 Use secure login (OAUTH2) for Yahoo, Gmail and Hotmail. Enjoy customizable Smart folder and unique signature for each of your accounts. Aqua Mail is the go-to app for all your email needs! Whether it’s a work or personal email, a corporate exchange server, or even a seldom-used secondary account, Aqua Mail lets you easily access all your emails from one complete app. Easy setup - just enter your email and password and you’re all set. With its flexibility and vast customization options, Aqua Mail’s goal is to reflect the needs of the modern-day user and provide a platform that anyone can tailor to their needs and preferences. Aqua Mail's seamless, yet powerful interface hosts a wide range of advanced features for setting up any type of email account. 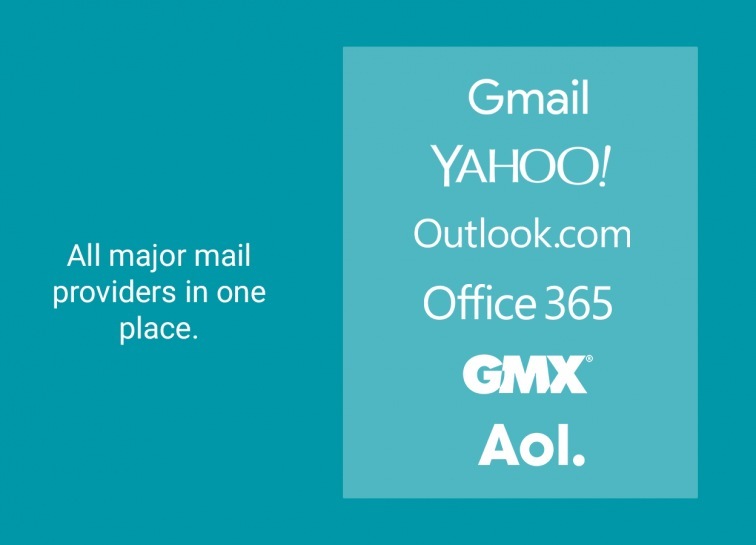 Multiple email providers: Gmail, Yahoo, Hotmail, FastMail, Apple, GMX, AOL and more. Mail accounts hosted at: Google Apps, Yahoo BizMail, Office 365, Exchange Online and others. Use of a “more secure” login method (OAUTH2) for Yahoo / Gmail / Hotmail. Backup and restore feature via popular cloud services (Dropbox, OneDrive, Box and Google Drive) or a file. Integration with popular third-party apps providing maximum control, synergy and customizability, including Light Flow, Enhanced SMS & Caller ID, Cloud Print, Apex Launcher Pro, Nova Launcher / Tesla Unread, Executive Assistant, DashClock Widget, Tasker and more. Push mail for most mail services (except Yahoo) and self-hosted IMAP servers, also for Exchange and Office 365 (corporate mail). Home screen widgets including message counter and message list. 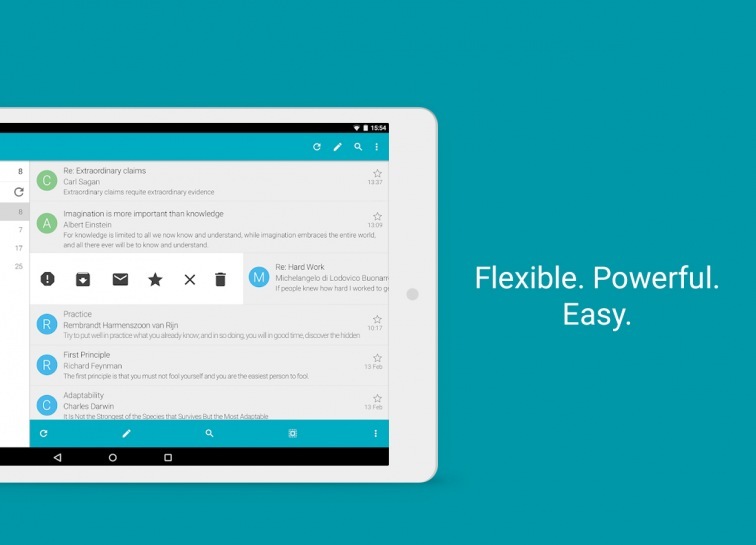 Use our Smart Folder feature to easily navigate and manage your emails. Calendar sync for Exchange and Office 365 (use any Calendar app or widgets). 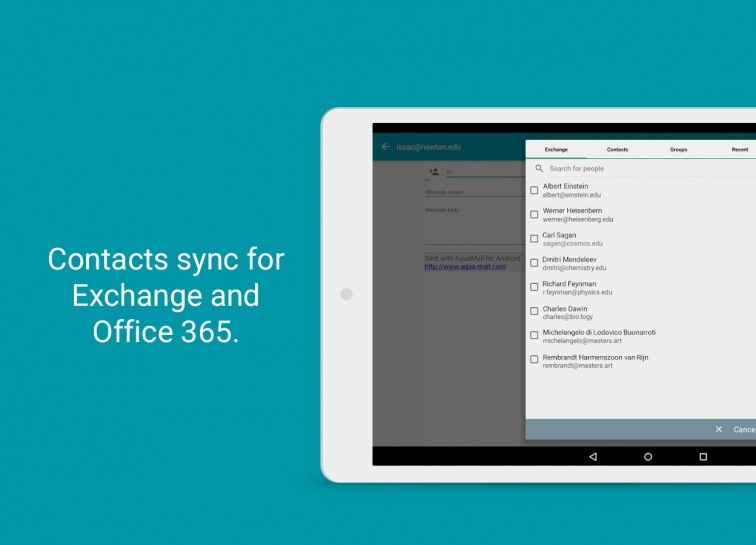 Contacts sync for Exchange and Office 365 (visible in AquaMail and in the Contacts app. Includes auto-complete and lookup in the corporate directory). 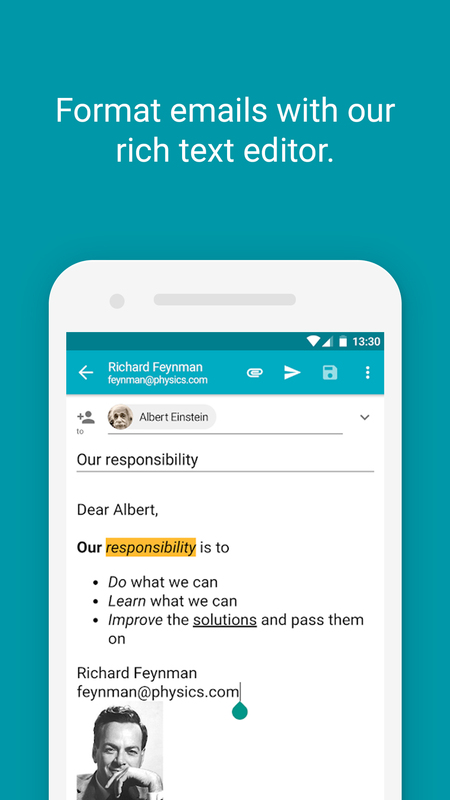 The rich text editor, styling choices and a large number of formatting options, including embedding images will help you create the perfect email. 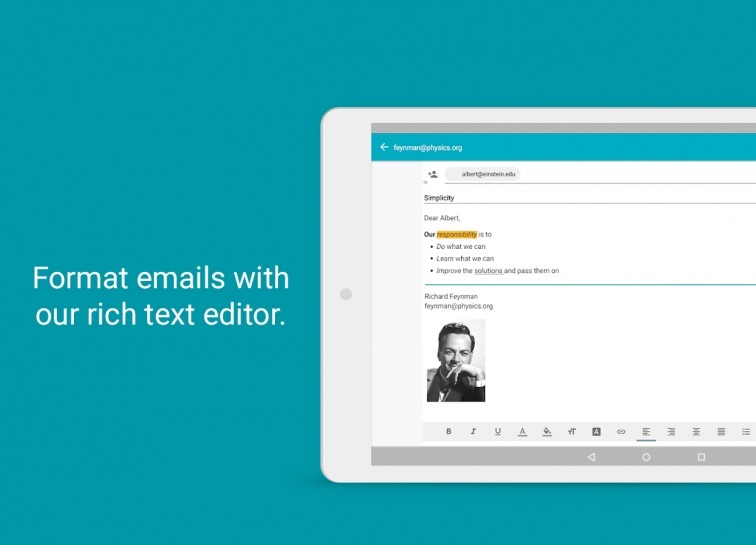 With the signature support you can attach a separate signature to each mail account and include images, links and text formatting. Notifications and reply via voice input from an Android wear smartwatch. Pick from the four available Themes and use the numerous other customization options to change how the app looks and operates. Separate network connection setting for WiFi and mobile data ensures optimum performance and cost-effectiveness.